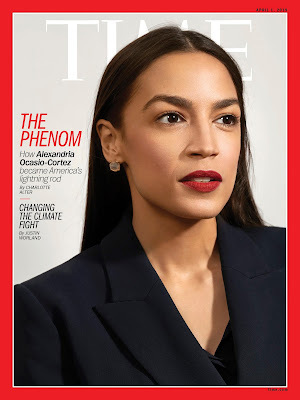 Socialist congresswoman Alexandria Ocasio-Cortez will be featured on the cover of the April 1 edition of TIME Magazine, according to CNN's Brian Stelter. The magazine describes her as "the second most talked-about politician in America..."
I call her extremely dangerous and have done so before anyone in mainstream media knew who she was. She is going to go places and she is going to be a role model for many high school and college students...libertarians, we have a problem. She campaigned on a platform of Medicare for All, a federal jobs guarantee, and tuition-free public college. With her skills and media appeal, she is going to be a big-time influencer, a major second-hand dealer in ideas. The TIME Magazine cover is just one more step in lefty establishment promoting socialism through her. She is now at 3.6 million followers on Twitter. How appropriate, the April Fool's edition. . .for all the year-round fools. Do you think it is possible that we already are at peak AOC? (I don't mean peak Socialism Movement). It seems she really says so many stupid things that she already is getting ridiculed a lot. Also her approval ratings aren't that good either even now..
How is it that people who rely on capitalism for their wealth and opportunities can be so enthralled with Socialism?